The devastating blight, which impacted the potato crop throughout Ireland beginning in 1845, was caused by a fungus known as Phytophthora infestans. This image depicts an electron micrograph of Phytophthora infestans growing on a potato leaf. The lemon-shaped sporangia are involved in spreading the fungus (even to healthy, harvested crops which are in storage for future use). Under the right environmental conditions—when the temperature is cool (20 C or less) and relative humidity is very high (95-100%) - the “cytoplasm in the sporangia divide and many swimming zoospores emerge from each sporangium.” Those zoospores spread the disease to other plants, potentially ruining potato crops over very widespread areas. Image online via the UK’s Agri-Food and Biosciences Institute. A devastating plant disease called "Late Potato Blight" ruins potato crops every year. Caused by a fungus known as Phytophthora infestans, the blight destroyed the Irish potato crop of 1845. The disease first infects exposed leaves and stems of the potato plant. As the fungus grows (the link takes you to a drawing of its genetic map), it produces spores. When those spores are washed into the soil by rain or irrigation water, the fungus spreads. Once the fungus gets into the soil, it infects the tubers and causes them to rot. Certain weather conditions help the disease. A prolonged rainy period, for example, will help the fungus grow and spread. Ireland had such a weather pattern during the summer of 1845. Once the fungus takes hold of the plant, it can spread quickly. First it acts like a parasite, getting its food supply from the plant. Then it increases so rapidly the fungus becomes a pathogen, causing disease and massive losses. The fungus itself is not very visible. It looks like a kind of white mildew on the surface of infected potato leaves and stems. The disease progresses, however, and as the tubers become infected they begin to rot. 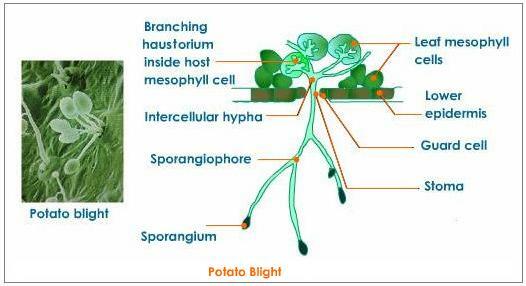 When Phytophthora infestans ruins a potato crop, all of the diseased material has to be removed and destroyed. That includes the tubers. The reason for this is the pathogen can survive the change of season on infected plant materials, putting the next season’s crop at risk. Unchecked, the disease spreads until it runs out of food. By then, the whole potato crop can be destroyed, as it was in 1845 Ireland. Bos, Carole "THE POTATO BLIGHT" AwesomeStories.com. Jan 01, 2002. Apr 23, 2019. What Can Happen When a Fungus Runs Its Course?